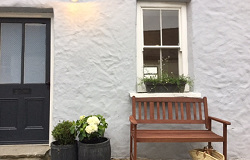 Quay Cottage is a cosy character cottage in the heart of Llandeilo, with views over the surrounding countryside. With 2 comfortable double bedrooms, 1 with an ensuite shower room and another room with bunk beds, we can comfortably sleep 6. With a log burner to keep cosy all year round, a decked garden with amazing views and a large family bathroom with a roll top bath and separate shower. 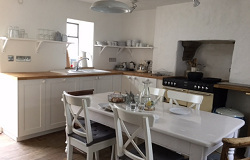 The kitchen has a large farmhouse style table, a range cooker, dishwasher and everything you need to prepare a feast with the amazing produce you can pick up from the local delis. We welcome well behaved dogs and there are lots of lovely walks directly from the cottage.